Kingsley William Amis was born on April 16th 1922 to father William Amis, a clerk at Colman's Mustard and mother Rosa Annie Lucas. He spent much of his youth and student life in London, where he was born and raised. Amis would grow to become a prolific and recognised name in British literature, but entered the world in substantially lesser circumstances. The author would later describe his early years as insular and narrow-minded, yet his path was carved out for him early in life. At the young age of eleven, Amis wrote his first deliberate prose and was encouraged to do so by family and teachers at Norbury College, in which he was enrolled. The young Amis had this work published in a small magazine put out by the college to showcase student work. Amis once described his childhood lifestyle with some disdain: "I slept in a drawer and had my baths in an outdoor sink. My nappies bore triangular singe marks where they had been dried on the fireguard. It was tough. My father's dinner would often consist of the contents of the doggy bag that my mother brought back from the cinema café (the Tivoli) where she worked." Beyond Bond: Free-thinking author of social-commentary novel, "Lucky Jim"
After receiving a scholarship to attend a wealthier educational faculty, Amis studied at City of London School until 1941 when he was offered another opportunity to up ranks and pursue University studies at Oxford. Whilst enrolled, Amis took part in a variety of activities, but his niche remained creative writing. Commenting later, the author noted his most influential experiences came not from the studying, but from associating with promising and dedicated authors including Elizabeth Jennings, Robert Conquest and Philip Larkin - the latter Amis extended a life-long friendship with. Philip and Kingsley shared many loves including pub crawls, American Jazz and debating aesthetics and the pomposity of the upper-classes. Amis' writer's career was put on hold temporarily as he was signed up for the armed forces just as the World War II broke out in Europe. 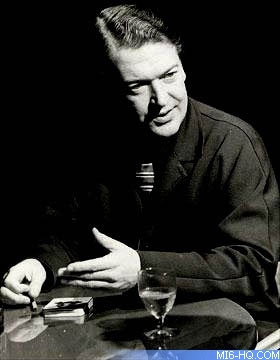 From 1942 until 1945, Kingsley Amis served in Belgium, France and West Germany in the Royal Corps of Signals. After returning to the UK, Amis continued to attend Oxford University and after two further years of hard study (his first research degree paper, "English Non-Dramatic Poetry 1850-1900" was rejected), he graduated from Oxford. During this period Amis associated with many of the "Angry Young Men" - a cliché somewhat distilled to describe an outspoken group of play-writes and authors shortly after the war. The group was touted by the press of the time as radical rich-haters. In 1947, shortly after graduating, Kingsley Amis married his first wife Hillary Bardwell with whom he would have three children. His son, Martin Amis, went on to follow in his father's stride and become an author and literary critic. Amis remained in close academic circles lecturing at both Oxford and The University College of Swansea. The budding author quickly became came involved in Communist and Stalinist movements within the universities and wrote frequently, contributing primarily to range of politically minded poetry anthologies. In 1947, his first solo work was committed to print - a collection of poems entitled "Bright November". Over the next few years Amis followed this up with a further three anthologies between 1953 and 1956. After 14 years of university lecturing, Amis left these academic circles in 1963 and began to focus on becoming a full time writer. Much of his early prose from this era can be directly attributed to his time at Oxford - inspired by the people, places and atmosphere of academia. His first novel, 1954's "Lucky Jim", firmly accredited Amis in the highly debated "Angry Young Men" which keyed into the anti-hero mentality of this circle. The comic satire sees Jim Dixon, a disgruntled literary professor, slowly crack under the pressure of job responsibility and a frustratingly old-fashioned dilettante. 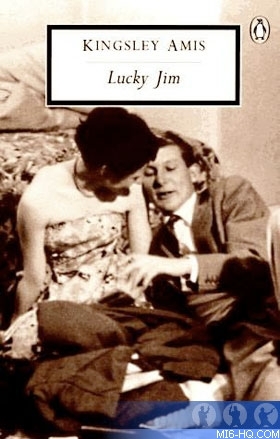 "Lucky Jim" was adapted for the screen 3 years later starring Ian Carmichael as Jim. This novel propelled Amis into international acclaim and the style of novel proved immensely popular in its era and is critically debated to this day. For this novel, Kingsley Amis was awarded the Somerset Maugham prize for fiction. 1956 saw Amis release his second novel, "That Uncertain Feeling", also featuring a Jim Dixson-esque character - taking a similar point of view to his first literary commitment, but as the characters grow they become even more bitter and pointed. Although these early novels conjure similar patterns, none lived up the critical acclaim or brilliance of "Lucky Jim". By this time Amis was growing less and less impressed by the power within the USSR and its fight in the name of Communism. The increasingly popular author began to break the ties with the local Stalin sympathisers in favour of a more upper-class British style of living. Later in his career Amis was noted to have touted anti-communist sentiment in both his beliefs and writing. Kingsley Amis crossed paths with 007 when he set about the first of many literary criticism and essay collections which investigated the world of Ian Fleming's creation - defining this trend it could be said. The publication was 1965's "The James Bond Dossier". So taken was he with 007, bar even his critical analysis of Fleming's work, that he delved deeper into the Bond mythology. 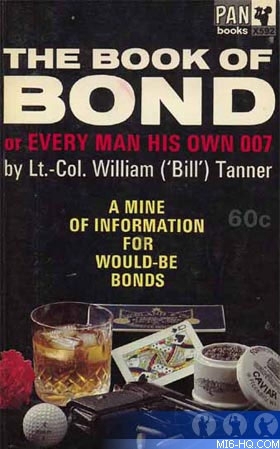 Amis adopted the not-so-secret pen name of Lt. Col.William Tanner to write his satirical guide to the world of espionage. First published in 1965, "The Book of Bond, or Every Man his Own 007" was originally sold with a false cover branded with "The Bible to be Read as Literature" for the potential secret agent to read on the sly. 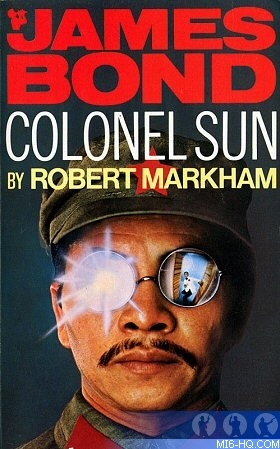 Amis gained the opportunity to carry on the 007 legacy in print in 1968 when he penned "Colonel Sun" under the pseudonym Robert Markham. Just four years post Fleming's passing, Amis was invited by Glidrose Publications (now Ian Fleming Publications) to write a follow-on James Bond adventure. By now, the distinguished author had grown to know the James Bond character inside out - having worked closely with him of two prior occasions - and began to quickly to formulate one of the most violent 007 adventures committed to paper. Amis originally intended to develop a series of 007 outings for print before his plans changed and Glidrose turned to John Gardner to continue the legacy years later. Although Amis' entry to the Bond fiction domain is less discussed and often forgotten by fans, it by no means deserves it, and stands up as one of the best post-Fleming literary adventures. In 1965, shortly after leaving Hillary, Amis married his second wife, Elizabeth Jane Howard with whom he lived happily until his death. Amis earned his first Booker price nomination for his 1974 novel "Ending Up" but failed to clinch the decoration until (after several nominations) he was given this prestigious writers award in 1986 for his work, "The Old Devils". His son Martin later commented that, in his opinion, "The Old Devils" was his father's finest work. 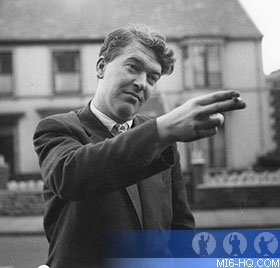 Over the course of his career Kingsley Amis penned over 20 novels, each a commentary, sometimes satirical, on a definite aspect of his surroundings. He always spoke honestly, if not candidly, in his writings. 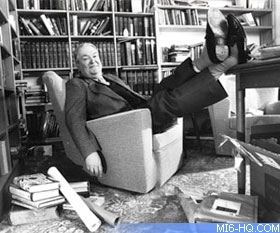 Sir Kingsley Amis was honoured with a CBE, Commander of the British Empire in 1981 and later offered a full knighthood in 1990 for services to literature. "No pleasure is worth giving up for the sake of two more years in a geriatric home at Weston-Super-Mare"
Kingsley Amis passed away on the 23rd of October 1995, leaving behind the unfinished follow up to his Booker prize-winner. Amis was 75 when he suffered complications after a fall. The author and father left behind an impressive and often controversial legacy but remains a prominent literary figure, and will be long remembered for his outspoken nature, clever and entertaining writing and of course his unlikely but brilliant run-in with 007.